When I began writing Uncanny Valley in January 2014 I was unaware that my own teacher John Gibson had written a work with the same title for piano, electronics, and speaker. I later learned that Nicholas Vines had written an identically titled work for solo piano as well. (Despite these coincidences, both composers gave me their blessings to proceed with writing a new work for orchestra.) It would seem that I’ve joined the ranks of a privileged and curious few composers who have been charmed by this concept of the uncanny valley, a theory originally proposed in 1970 by the roboticist Masahiro Mori in a paper for the Japanese journal Energy. A grand piano F#3 prepared with a magnet approximately 6 inches away from the hammers. The strings decay over a period of 23 seconds. The magnet covers all 3 strings. Resultant pitches include beautiful combination tones whose upper partials die away one after another. This is the timbre associated with the end of the piece, when the interpolation coefficient = 1.00. The piece begins with a coefficient of 0.28 and then peaks at 0.75 before plummeting into the “vallley” (a coefficient of 0.00). As the response to this non-human entity becomes more positive, a sudden dip in the curve heralds a state of absolute repulsion—the curve dips down into a valley of minimal-to-no affinity whatsoever, after which it begins to rise again. This valley of the uncanny, of repulsion and eeriness may be due to what Mori identifies as “a form of instinct that protects us from proximal, rather than distal, sources of danger. Proximal sources of danger are corpses […] and other entities we can closely approach. Distal sources of danger include windstorms and floods.” The paper gives a number of examples of these entities and locates them at various points along the curve—dolls, masks, healthy and ill people, Bunraku puppets, etc.—while corpses, zombies, prosthetic and myoelectric hands reside at various points in the valley. 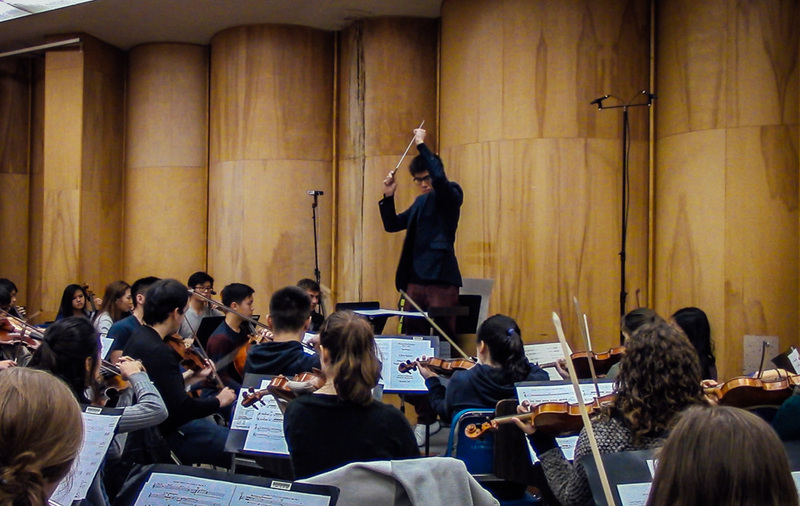 IU Concert Orchestra reading ‘Uncanny Valley’ in November 2015, conducted by Alvin Ho. I became interested in Mori’s theory after viewing David Lynch’s documentary on surrealist cinema for the BBC (1987). Among the films screened in this documentary was The Girl with the Prefabricated Heart (1947) by Fernand Léger, which features mannequins filmed up-close. “I guess anything that looks human but isn’t is frightening,” Lynch spoke of the mannequins. “It goes back to this tremendous fear of the unknown.” Why is it that mannequins or masks often appear to be scary or unsettling? What are their musical parallels? In Uncanny Valley (2014) for orchestra, the graphical curve Mori used to illustrate his theory is treated as a control source, governing the piece’s formal design and the movement of individual sounds. The large-scale movement of the piece is between the orchestrations of two source sounds—both samples I made of prepared pianos. The curve acts as the non-linear “morph” between these sounds. In this way, Mori’s curve has been represented both metaphorically and empirically in the music. When the curve is in its valley, the orchestrations most closely resemble a piano sounding its lowest note, the lowest key of A0, its thick string scraped with the fingernail while the damper pedal allows its resonances to decay for as long as the string will vibrate. In the valley of the score the quiet, rolling percussion including low timpani, tubular bells, and gongs (excited by dragging superball friction mallets across them), attempt to recreate the residual noise along with the delicate resonances in the winds and strings, each derived from a time-series analysis of the sound. The low A0 of a grand piano scraped with a fingernail. This sample has been reversed and time-stretched over a duration of 2:11. The low A0 is associated with the valley, and the first section of the piece can be characterized as a large scale movement towards the valley. The latter sections of the piece might be called a large scale movement out of the valley. Towards the end of the piece when the curve is at its highest (representing the highest level of affinity for the non-human entity) the orchestrations most closely approximate the sound of another key, a G3 prepared with magnets. Placed directly on the strings, these magnets reveal beautiful inharmonic timbres as the key is pressed. The work progresses along the curve and moves between these sounds as the curve gets closer to one extreme or another. Both sounds were analyzed for their internal frequency content, which was then orchestrated and used as a compositional basis for the piece. An application was developed to allow the uncanny valley curve to “morph” one sound into another. These tools of computer-assisted composition (CAC) were essential to constructing the raw materials of the piece, opening up the creative space necessary to make a majority of compositional decisions by hand.